As the first hands-free video assistant to hit the market, the Amazon Echo Show gives us a glimpse into the future of home automation. Unfortunately, it's ecosystem needs to catch up to fully enjoy all it has to offer. Just as we’re getting used to our voice-controlled speakers, Amazon throws us a curve. The Echo we’ve grown to love now has a touchscreen attached to it. The addition is not all that surprising. It’s a natural progression toward turning our homes into the futuristic enclaves we’ve dreamed of. But with a heftier price tag than other Echo products, the question comes down to whether the fancy new screen really adds enough to warrant a spot in our homes. My first impression with the Echo Show was that it was much bulkier than I anticipated. With paper thin screens and borderless designs becoming all the rage, the Echo Show felt dated. Almost like I was seeing the Sony Dash brought back to life. The border around the screen is wide which makes the screen look smaller than it is. The back of the device is thick enough to not need a kickstand of any sort. The heart of the device is the 7-inch touchscreen in the middle. With a resolution of just 1024×600, it reminds me of your lower end Kindle Fire screens. At this price point, it’s tough to expect much more. The touchscreen would have the occasional hiccup but overall worked well. The 5 megapixel camera above the screen is impressive and allows for a crisp video chat. Buttons on top allow for control of the volume as well as muting the device. Muting will also disable the camera (which will illuminate a red light above the screen). Unfortunately one of the design flaws with the Echo Show is that it only works at one angle. You can’t tilt the screen up or down depending on where it sits in your home. So if you’d like to use this on your shorter nightstand, you’ll be crouching down to video chat unless you want the camera aimed right at your crotch. One area that is a marked improvement on the standard Echo is the speaker. This is in large part due to the pair of 2-inch Dolby speakers inside. The tinny sound is gone and the bass doesn’t get as muddled at higher volumes. While I think you’d be better off with an external speaker (like Sonos) in a large room, it works fine in smaller and medium sized settings. 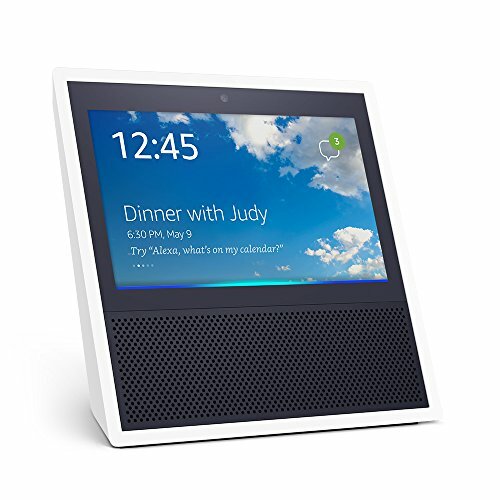 The Amazon Echo Show comes in both black and white. It connects to dual-band Wi-Fi on either 2.4GHz or 5GHz networks that use 802.11a/b/g/n. There is of course Bluetooth connectivity but unfortunately no audio output like the Echo Dot. Overall it’s not that I hated the Show’s design, it just lacks creativity. Being the first to market with the screen gave Amazon a huge opportunity to blow people away. Instead it looks like they punted and chose the most generic, not-threatening route they could. It’ll be interesting to see if they make improvements to this in the near future or offer up a more modern looking version. Is the Screen Worth It? It’s worth pointing out that the Echo Show does everything that the standard Echo devices do. They can turn on and off compatible lights. They can give you the weather or updates on a sporting event. Play music through Spotify and Pandora. If there is a skill available, it can handle it. So at the very least you’re getting the standard Echo functionality with the Show. When it comes to specific uses of the video screen, you’re getting much more limited. When asking for the weather it’ll pop up the forecast on the screen but no radar. If you want to scroll through a grocery list, it will provide it on the display. Seeing the album cover of a song that’s playing is nice I guess. But none of these things feel important or necessary. And that’s the problem with the Echo Show at the moment. There just isn’t enough to really do with the screen. And the stuff that you can do like look up a YouTube video or watch a TV show feels like something I would rather do on another device. Now this isn’t necessarily Amazon’s fault. As their products get adopted in more households, 3rd party skills will become available that utilize the screen. But for now, I just didn’t find myself using it that much. Now the one notable exception to this is those with security cameras. The Nest Cam for instance works flawlessly with the Echo Show and it was the one time I truly appreciated the video screen. Being able to ask Alexa to call up each camera and watch the feed is fun. I think it’d be great for parents who want to keep an eye on a little one in their crib. Or an older person who wants to see who’s at their door. There are Alexa Skills available from Nest, Ring, August, Logitech and Netgear Arlo at the moment. Perhaps the most marketed feature of the Echo Show is the ability to make hands-free video calls to others. 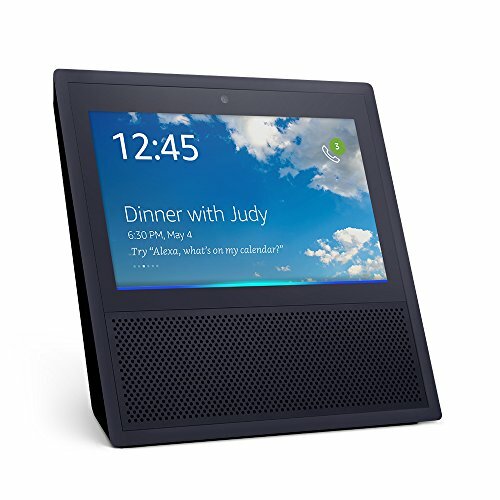 The big catch is that you can only do this with others who have an Echo Show or use the Alexa app on their phone. This is similar to how Facetime works for Apple users. Now setting up this feature is simple. Your phone number is registered with Amazon and the Alexa app will go through your contacts to find others with this functionality as well. Those it finds will be added to your contact list in the conversations section. There is an option that allows you to block contacts. The video chat was incredibly smooth each time it was used. The 5 megapixel camera provides a nice picture and the sound quality was clear on both ends. It was my first real experience with hands-free video calling and I have to say it’s something I could definitely get used to. I think this would be perfect for someone who isn’t tech savvy or perhaps limited in their mobility. You may have noticed their ads focus a lot on seniors using the device and that seems like a perfect fit. One of the stranger features on the Echo Show is the “drop-in”. This is disabled by default (I would definitely make sure yours is) and allows those on your contact list to just drop-in for a call whenever they like. You get a 10-second window where they’ll see a foggy screen to decline. But if you don’t decline in time, they are looking straight into your home. I struggled to find many scenarios where this would be something I’d want enabled. Perhaps if it was to check in on the kids at home after school. Or if you were dating someone who was really suspicious of you cheating. But giving people unfettered access to the camera in your home seems odd. And while it can be disabled, the mere fact it’s in the options made me a little nervous to use this in a bedroom where I may be in a compromising position. I think I like the idea of the Echo Show more than I actually liked using the Echo Show. It ended up being like another non-video Echo version in my home except with the added anxiety of a camera that’s always on. Don’t get me wrong, it’s a perfectly fine device that finally brings voice-activated screens into our lives. But the screen just doesn’t do enough now to warrant the price. In the next year or two I see that changing. 3rd party Alexa Skills are being added regularly and they will surely start integrating the video screen into their software. But by then, will a better version of the Echo Show be out? Amazon has already announced a more compact version called the Echo Spot due out by the end of 2017. The exceptions to this are those who have friends and family with Echo Shows already who want to communicate through video chat. Or those who want a cool way to call up their current security cameras. Otherwise I think you’d be best off waiting to see how the skill ecosystem evolves and perhaps whether a more attractive design hits the market.